What kind of fire sprinkler systems will you choose for your business? Automatic fire sprinkler systems play a critical role in keeping your commercial building safe. These systems work to minimize the damage by working to contain the fire until firefighters make it to your business. 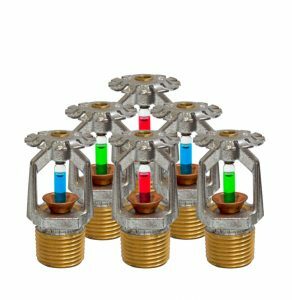 But did you know there are several different types of fire sprinkler systems for you to choose from? Let’s go over these fire sprinkler systems and how you can have them installed in your commercial space. Wet pipe fire sprinkler systems are one of the most common types of sprinkler systems available. This system got its name for the water that fills the pipes from an automatic source. When the sprinkler heads are exposed to heat, a heat-sensitive element on the heads will activate and release, allowing the water to flow from the pipes. These systems often include an automated alarm check valve that sends a signal to the building’s alarm system and allows water to flow through the pipes. Wet pipe sprinkler systems are often low maintenance and cost-efficient. They are also found in high-rise or office buildings with only a few floors. Dry pipe fire sprinkler systems use pressurized air from the pipe followed by water. This does cause a minute or so delay in the water discharge. These systems are ideal for buildings where the temperature is low enough to freeze the pipes, making other systems ineffective. Dry pipe sprinkler systems have a fast opening tool that is used to get rid of the air and to speed up the water flow, making this system customizable. Warehouses in frigid temperatures often use these systems in order to keep the pipes from freezing. Deluge sprinkler systems differ from traditional systems because their sprinkler heads are kept open. Once smoke or fire is detected, the water is released from a discharge device in the system. Deluge systems are often found in areas where fire can consume a large area over a short period of time including industrial parks and in chemical storage facilities. Pre-action sprinkler systems are filled with air and water that is only allowed to pass when the smoke alarm or fire detector is activated. This system requires two triggers in order for the water to flow. This sprinkler system is perfect for areas that can trigger a false alarm or for when the sprinkler system has a mechanical failure. These systems will work to avoid soaking your items unless it is absolutely necessary. Pre-action systems are often found in libraries and data centers where water could ruin high-value electronics and books. When working with Anderson Fire Protection, Inc. to design your fire sprinkler system, your building will have the best system possible. For more information on our fire sprinkler systems, call Anderson Fire Protection, Inc. today! Fire Sprinkler Systems with Anderson Fire Protection Inc. This entry was posted on Monday, August 22nd, 2016 at 12:04 pm. Both comments and pings are currently closed.